If only I’d have known these family holiday survival tips years ago. When I remember holidays with my family of origin, I think of stress. The image that comes to mind is everyone else laughing and having a great time, while I was miserable. I don’t remember many holidays as a child, but as an adult, holidays used to be times of emotional abuse from my parents, mostly my dad, and from my ex-husband. While we were married, the usual pattern for my ex was to work up my emotions right before we arrived at my parents’ house. He’d feign a misunderstanding or falsely accuse me of something or he’d criticize me–whatever would upset me. By the time we arrived at my parents’ house, I’d be on the verge of tears. Then my parents would correct my bad attitude. All three of them would join against me for ruining the special day. My daughter, Bethany, and I were both the targets of comments about our weight or other parts of our appearance and whatever other “weakness” my dad could find. In our healing from abuse, Bethany and I have learned a few things about getting through this stressful time of year. Now we know that we deserve to have a nice drama free holiday. We haven’t had a relationship with most of our family members in years. We celebrate the holiday differently each year–but each year, we make decisions based on what’s good for us rather than what tradition dictates or what is “expected” of us. Being a child in a dysfunctional family taught me I’m responsible for others and caring for myself is selfish. I had a tendency to take care of other people’s feelings but neglect my own. I used to think people earned certain rights to me if they were “nice”. If they gave me gifts or said kind things to me, I believed that gave them access to me and that I couldn’t say no. But I’ve learned nobody has the right to buy me or rent me through “loving” things they do. Love that comes with obligation isn’t really love. I’ve been in many relationships–with family and otherwise–where I didn’t feel comfortable walking away until I could prove they’d done something wrong. Now I know I don’t have to be with anyone I don’t want to be with. I have permission to decide how to spend my time and who I spend it with. 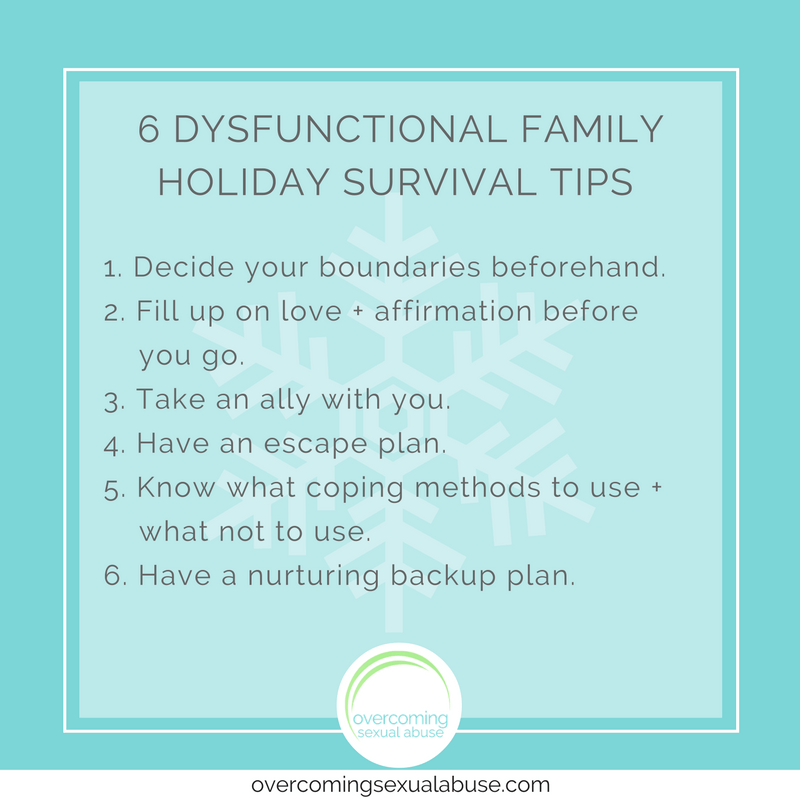 I also don’t have to label my family as abusive or dysfunctional to justify not spending the holiday with them or to set boundaries with them. And setting boundaries doesn’t make me mean or bad. It’s taken Bethany and I years to feel comfortable saying no without needing to offer an explanation or excuse. We’ve gotten better at saying yes to ourselves a little at a time. Now we are confident that we don’t need permission from anyone to chose what’s best for ourselves. 1. Decide your boundaries beforehand. 2. Fill up on love and affirmation before you go. Spend time with friends who are loving and affirming of your value before you face people or situations that cause you to doubt it. 3. Take an ally with you. If your family treats you like a child, it’s easy to fall back into that role. Taking a friend can ground you to the present day and remind you you’re an adult with choices. Having an ally may help you feel more confident to walk away from poor treatment or to stand up to it. Also, some family members may not be as likely to be abusive or disrespectful if you have someone with you. Make sure you have your own transportation and can leave anytime. 5. Know what coping methods to use and what not to use. If you need to stay away from the adult drama, play with the children or keep busy by helping in the kitchen. Stay present so you can monitor the situation and your feelings and take action if necessary. Drinking won’t help you to stay empowered and may make you more vulnerable. If you feel the need to drink, let that be an indication that you are feeling stress about something. 6. Have a nurturing backup plan. In case you need to leave, have food prepared or at least available. Plan comforting or empowering things to do–like watching movies or something else that you enjoy. Finish a project if you feel up to it or call a friend. Bethany and I no longer feel victimized by the people who supposedly love us. We choose to spend the holidays in ways that empower us. We wish the same thing for you this year. Whether or not you have a supportive family, we hope you know you’re not alone this holiday season. 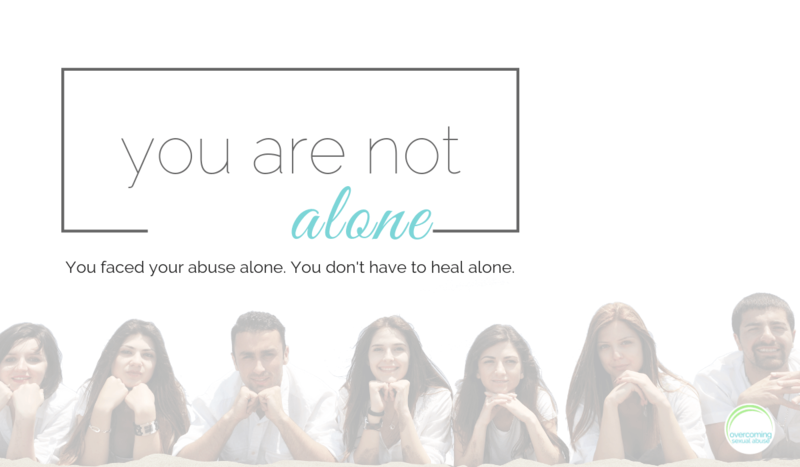 Your Overcoming Sexual Abuse family is here for you. Happy Holidays! What is your holiday experience with your family? If you spend the holidays with your family, do you enjoy it or do you feel obligated? Please comment below and remember to subscribe to the comments so you can continue to participate in the discussion. You don’t have to use your real name. Email addresses are never made public. This is awesome! I had stayed away from my family at holidays for years. Seems that when there is only one or two present the abuse is managable. But when the holidays come and they are all in the same location I am left feeling like I was hit by a tornado. I get accused of strange behavior, they treat my 11 yr old daughter as if she is 5. Then when the holiday is done, I am whispered about and called fruit loop. So i again said I would not do holiday dinner with family and then other family was told I showed up I invited? That won’t be a problem anymore. I have three invitations from my boyfriend, a close friend, my roommate and i am sure before it is all done several more will come in. So this year and from now on I will stick with where I am welcome, rather than trying to force something with family. And this all happened because I stood up to them. That’s so great that you stood up to your family too and stood up FOR you! I’m glad you’re seeing the benefits. Your description of whispering they would do about you reminded me of my ex sisters-in-law. My ex-husband’s family gatherings were abusive in that way. Spending time with them just gave them more material for gossip. I’m so happy those days are over. That was a great read. I love your advise. Thank you so much for sharing. Thanks for your feedback, Marc. Welcome to OSA! This week I am thankful for OSA !!!! i could relate a lot to this. But had a great time with hubby’s friends. I guess right company is important to enjoy any vacation…otherwise its better to roam alone. Now I just choose to do what I feel like doing for holidays and I get to decide what they even mean to me. And that rocks 🙂 It’s freedom. I’m happy for you that you found people you enjoying being around. I agree that it’s such an important part of enjoying your time and that if you can’t find that, it’s better to be alone. Before I started healing, I never considered being alone as an option. I was still operating from my childhood fears of abandonment and it’s taken a long time to face the many layers of that fear. Until I really dealt with that, my choices were so limited because I was so afraid of being rejected or alone. Options really opened up for me when I began to reconcile with myself and give myself the things I needed. I completely agree that freedom rocks! I can relate to having to make an effort to remember that “I’m an adult, this is my life, I make my own choices.” Dysfunctional families train us not to belief that truth. Yay for us for searching for the truth and living it! Thanks for sharing. Thank you so much for this article. People think that because I choose not to have my verbally abusive father and sisters in my life that I must hate them. Not the case. I just don’t need negative in my life. Life is too short to put up with negitive! This year for the first time in 2 years I will see my sisters. I read your article to my husband and we made a game plan! I’m so glad you came up with a plan. Please let us know how it goes for you and if you come up with any other ideas for empowering yourself. Thanks for your comment. Great read and story. I stopped doing obligatory holidays a while ago. My holiday with my mother around was so stressful and abusive. I would feel as though I was 15 years old and a total screw up. The I would resent all my time there and go home with an emotional hangover that took days to get over. This year I hung out with my aunt and my cousins with my family. Great day, lots of laughs and no tension. What a relief. I divorced my mother a year ago. After the initial pain, I am now finding freedoma nd relief. So good to read posts, knowing I am not alone. Thanks. That’s so great that you aren’t manipulated by obligation anymore and are choosing what you want. Hooray for freedom! I can relate to feeling like I was right back as a child. The truth is that feeling like a child shouldn’t feel bad at all. A child shouldn’t feel shamed and wrong all the time. A child shouldn’t feel powerless and invisible. It shouldn’t be a bad thing to be younger and smaller. Just the fact that “family” wants to put us in former roles reveals so much. Thanks for sharing! This is awesome, I’ve been doing some of these since I got clean 6 years, the helped me alot. Not being around my blood family is hard, but my sober family makes up for it in a better way. Just have to say Thank you to you Ladies, for giving me the encouragement everyday to work on my past abuse issues!! I look forward to having my freedom back one day..
Congratulations on getting clean and standing up for yourself! It sounds like you’re well on your way to freedom. Thanks for sharing! I am a survivor of childhood sexual abuse. I was sexually abused by many but the one I want to talk about is my father. As a child and adult I have suffered from eating disorders, post-traumatic stress disorder, panic, anxiety. to do with. Unfortunately my sexual abuse was disclosed by one of my brother’s wife’s when infact she had absolutely no right to say anything to my parents. This happened approximately 16 years ago. I was then told I was crazy by my dad, he was going to have a psychiatric assessment done on me (thank goodness I knew better), correspondence from the false memory syndrome, and my mom said she did not believe me as my dad had never done that to her. My memory recollects that this abuse by my dad happened when I was 10 years old. When it happened my mom was hospitalized for surgery and spent months recuperating in a convalescent home. My niece told me in confidence and does not want me to share it with anyone. I want to be able to share it with other family members but like me I was never believed by some family members, she feels the same way. At present I have no contact with my parents and even moreso since I found out what happened to my niece. My father has also brainwashed my daughter into believing him. It has hit me so very hard as my precious grandchildren are now 4 & 10 years old. I suffer from nightmares and the list goes on. Please help me. I just found your website by accident. Thank God. My life too, has been filled with a long list of abusers, but oddly enough God spared me and gave me a decent and loving husband who has seen me go thru one emotional roller coaster ride after another. (can’t believe he’s stuck with me for 29 years) Our family was quite dysfunctoinal, but I’ve always been there for them everytime they needed me for something. I feel so guilty now, as this was the first Christmas that I have not been with them. My husband put his foot down and took his stand on being my “protector”. He prays for me every day and I know that has helped me enormously to start seeing the truth. The truth really does hurt. I think it’s especially hard when you love the Lord, and believe that it’s our “duty” to love everyone and to forgive…. Forgiving I can do (with His help of course), but I don’t know exactly yet, what real love is, or how to even love myself. I haven’t had the courage to confront my dad, since I know that he would deny everything and make me feel like a fool. (he’s very intimidating) Do you think it’s wrong to disassociate yourself from parents? The last time he called he told me that I would feel terrible if something happened to them (he and his new wife, who is extremely manipulating. My mother(a wonderful lady) passed away, due to the stress he put on her, I firmly believe) Anyway, how can I stop from feeling like a “bad” daughter and get some peace? Thanks. I am in the same situation. My niece (25) disclosed to me, also she is suspecting my father, she has dreams and partial memories of sexual abuse. The whole family (minus one brother) dismisses me as a crazy person who lies. I was sliding by on a veneer of “it’s over” “it’s a moot point” “I can be the bigger person and drop the subject” but after my niece’s disclosure to me, she genuinely wanted to know my own memories. I told her just one event. Now my sister (her mother) is telling me to stop talking to her. Saying I don’t really remember what happened, and nothing happened with my father. I no longer can tolerate this. I have written and rewritten scores of good bye letters to my family. I want to be free of it. I will no longer go to family reunions. I believe there is biblical support for forsaking family if necessary to follow the Truth. This is in that category, If I keep going to family gatherings, i’m basically complicit with handing over the new generation of babies to the same men (also my brother) who I know for a fact are sexual abusers. It does nothing to tell somebody, I am denounced as a witness. It revs up the attacks against me as a witness. been there done that. I came to this website today to get clarity on this very predicament. How to cleanly extract myself from traditions that have revealed themselves as toxic. To continue, the voices over my shoulder are saying “but I owe it to the children to try anything to prevent any more molests.” My family ganged up on me and took custody of my 3 year old and 6 year old and gave them to my first husband, in response to a sexual abuse investigation regarding my daughter and HIM. 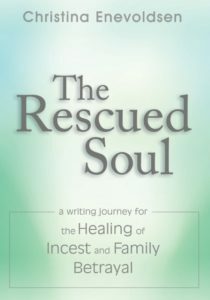 My family pulled my sexually abusing first husband into their midst and threw me out. Facts do not sway these people. My child’s testimony was construed as evidence that I brainwashed her. There are stiff penalties to confronting abuse in my family and they are a well oiled machine of mutual protection. Writing this causes me to more squarely face the real nature of my family. Its a social organization dominated by sexual predators. All the members protect them, not the children. Do I really want to attend the meetings of that organization? No I do not. Another Christmas and so what, I learned not to anticipate or care about it. I recognize it as a celebration of Jesus’s birth and make the best of it with my husband but that’s about it. Christmas has been a negative most of my life. It was 2 weeks of hell when I was young being trapped with the family, I couldn’t wait for it to get over. Too much drinking and the abuse on all levels. I have a picture when I was probably 6 of the family in the living room sitting around the tree, I was off in a corner by myself looking vacant. I have read about introverts lately and how crowded rooms, bright lights and loud noise is too much on us sometimes. That brings clarity to a lot of life situations and why I am not comfortable around a lot of people, but also a lot of it back then had to do with being numb and in shock most of the time. The rest of the family were extreme, attention getting, extroverts, they drove me crazy to be around them long. Then I married a man who was a real humbug when it came to Christmas, he did his best to ruin it for me and the kids. He made it a real nightmare. I completely lost it 20 years ago when my siblings decided for the benefit of family they had to call a family meeting to make it clear to my parents what the relationship with my brother was doing to me. I was 37 and haunted by him and the inappropriate actions he still pulled. I had enough of it. I begged my siblings to lay off of it, that it won’t go down well. They went ahead with it anyway and what came out of it was them collectively abandoning me after Dad threatened that I was off the will and they would be next. My parents played just as much of a role by denial and my Dad encouraged my brothers sick behavior throughout my childhood. It was a big joke to him and he got a sick thrill too I’m sure! After the outcome of that meeting I shut down completely, sometimes I was catatonic. My daughter moved out at 17 because she didn’t know how to deal with me. My sons were primed by my family and were around when there was a lot of smack talk going on about me and my new boyfriend, now husband. They resented him as many teens do with the new man in Mom’s life. My family played on that and drew them to their side. For 18 years my sons didn’t acknowledge me on any occasion, TG my daughter never gave up on me and always does something special for me, she got over the resentment and learned to love and appreciate my husband too. Since Mom died 2 years ago my sons are reaching out a piece at a time, but they live in another province, so getting together as family just doesn’t happen at Christmas. This Christmas will be rougher because we usually got together with my daughter’s family but she moved back to our home town and lives far away now too. She wanted to be closer to the cousins and family on her Dad’s side since she has children now and thought it was important for them to grow up with the other kids in the family. It hasn’t been easy for her since she hasn’t had contact with my siblings since Mom’s death because of how they inherited and how they are well off now and left me out as my parents willed it. They think it is about the money, it is, it is about the principle around it and how they gained, not the monetary so much,but their superior attitude and also the way they treated me shamefully in front of my children during Mom’s funeral. Since then my kids lost respect for them. They have called and bugged my daughter for get together’s that she’s made excuses not to attend but she knows she can only put them off for so long, especially with Christmas coming up. She’ll have to decide for herself how much, if any, contact she wants with them. The emotions around my daughter moving away and hearing even snippets about the siblings I walked away from has caused flashbacks about their horrible treatment. I don’t have them about my abusing brother or parents so much, they are dead and gone, but it will always be tough getting my head around how they so easily dumped my like trash. Until then I thought we had a half decent relationship, that they understood, isn’t that what the meeting was about, to try and help me? One day when push comes to shove I will confront them and blast them how they deserve. I am getting stronger and more confident in my own right since moving away and starting new, especially if they say or do one thing to hurt my daughter and her family. They need to get told by me exactly what I think, one day it will happen because I’m tired of them and how they go on to others how their heart breaks, that they miss me, blah, blah! They only do it to evoke pity and enlist more people to look down on me. My children are strong too and will let them all have it if they say anything ignorant about me now. If they have any sense they’ll lay off, but it’s not like them really. Out of curiosity my daughter may go to see what, if anything, they have to say. Anyway, that’s about it in a nutshell, Christmas can hurry up and come and go as far as I’m concerned, other than it is a good excuse to get something special for my grand-kids. Maybe this year will be a little different in that we found a church family and celebrating Jesus’s birth with others will be a good thing. But that’s the other thing, my Dad used to sing Christmas carols at the top of his lungs to drive my Mom insane and she’d get screaming and carrying on, so Christmas music kind of touches a nerve too. I sing duets with my husband at the church but I think the Christmas songs would be too much to handle with the emotions. I could be wrong, maybe it is time to get over that, we’ll see! I’m thankful for media like this because I do relate strongly to feeling put out by family at invited holiday events. I have had an unhealthy desire for approval from my grandparents, that became dysfunctional when I felt entitled to move into their home after years of feeling inadequate in their eyes. I found it very difficult to say no to them, I felt obligated to go even though my emotions, and alcohol use, caused me to behave erratically and impulsively around them. This desire to be approved of translated to my husband’s family quickly. Alcohol was very much more available in larger and stronger quantities and I wound up dangerously intoxicated and blacked out at family thanksgiving one year ago. I didn’t have any idea what I had done after I stopped drinking, then I found out videos had been posted to Facebook without my or my husband’s permission. After a short hiatus away until christmas, it took 6 months for it to come to a head and finally start to be resolved outside of myself with the other members of the family. This past monday 11/25/13, I celebrated 365 days of sobriety. 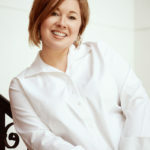 This year has gone smoother, because I am capable of protecting myself and my husband has seen the need to cover me and the reputation of our marriage that was damaged as a result of that evening. I am beyond thankful, I owe my life to getting sober, to choosing to remove unapproving family members’ opinions from my image of myself and remembering my chosen place as a child of God, born and living with a Purpose. Thank you for this article. I am SO thankful I came across this post! Its just what I needed to read especially with the holidays coming up. I will apply these tips as I set boundaries to help me stand up and be empowered while attending an upcoming family get together Christmas Eve. My husband will be with me, so that gives me peace of mind. But… if I later decide not to attend…that’s okay too. I need to do what’s best for me! Thank you Christina for the help you give to survivors. You are amazing!